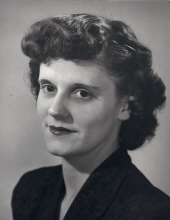 Sarah “Sally” Elizabeth Klees Murray, 98, died quietly at home in Staunton, VA, on February 6, 2019. She was preceded in death by her husband, Riley Allen Murray, Jr. and her siblings, John, Henry “Bucky”, and James. Sally is survived by her son, Riley A. Murray, III (Ann) of Waynesboro, VA and her daughter, Jill Murray (John Fitzgerald) of La Jolla, California, three grandchildren, James Murray (Diana Baracaldo) of Sao Paulo, Brazil, Ellen Saxena (Vikas) of Alexandria, and Erin Murray (Colleen Kivley) of Harrisonburg, VA, great-granddaughter, Olivia Murray of Sao Paulo, Brazil, and numerous nieces and nephews. Sally was born January 21, 1921, in Emporium, PA to J. Raymond and Perna Gaskill Klees and was a graduate of Emporium High School, where she was salutatorian for the Class of 1938. In Emporium, she worked for Sylvania Electric following high school and until her marriage to Riley, also of Emporium, in 1949. Their life together began in Baltimore, MD, and later moves took them to Redondo Beach, CA, Mogadore, OH, and Springfield, VA. Following Riley’s retirement in 1982, they moved to Sun City, AZ, where Sally remained after Riley’s death in 1984 until returning to Virginia in 2010. While in Arizona, she continued her lifelong enjoyment of golf, volunteered at a local food bank, and began to explore the world with trips to Europe and South America. Sally was a dedicated and loving wife and mother whose kindness of spirit and sense of humor were appreciated by family and friends. She will be dearly missed. The date for a Celebration of Life service has not been set. If anyone would like to make a memorial donation, the family suggests The Legacy at North Augusta in Staunton, VA (https://www.thelegacyatnorthaugusta.org/philanthropy/) or one of Sally’s favorite charities: Planned Parenthood, Habitat for Humanity, or The Nature Conservancy. To send flowers or a remembrance gift to the family of Sarah Elizabeth (Klees) Murray, please visit our Tribute Store. "Email Address" would like to share the life celebration of Sarah Elizabeth (Klees) Murray. Click on the "link" to go to share a favorite memory or leave a condolence message for the family.